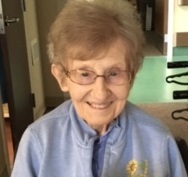 Dominican Sister of Peace Elaine Marie Carey, OP,(Elaine Jean) (94) died at the Sansbury Care Center in St. Catharine, KY, on October 26, 2018. Sr. Elaine Marie was born in 1924, one of the two children of Cecile Frederick and Raymond Charles Carey of Memphis, TN. She entered religious life in 1944. Sr. Elaine Marie earned a Bachelor of Arts in Home Economics, English, Education and Philosophy from Siena College in Memphis, TN, and a Master of Arts in Religious Education from Catherine Spalding College in Louisville, KY. She also studied Theology and Pastoral Counseling at St. Louis University as well. 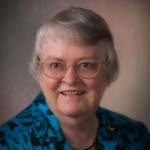 Sr. Elaine Marie served as a teacher and administrator in Arkansas, Illinois, Indiana, Kentucky and Nebraska for twenty-five years. In her reflection at Sr. Elaine Marie’s service, Sr. Rose Cummins, who had her as a teacher and later lived with her as a Sister, described her as, “A teacher who expected the best from her students and challenged them to move beyond their comfort zones… but the twinkle in her eye and her smile told us that while she meant business, she enjoyed a little monkey business.” Sr. Elaine Marie followed both her God and the needs of the times, answering the call to change her personal ministry as the community required. She served as a religious Education Consultant in Omaha, NE, then as a Director of Religious Education in Illinois and Kentucky, then returned to study at St. Louis University to prepare for ministries as a Chaplain at two Louisville hospitals. She also served her Community as a volunteer at the St. Catharine Motherhouse and Sansbury Care Center. In 2005, she became a resident of Sansbury Care Center and began her final ministry of prayer and presence. 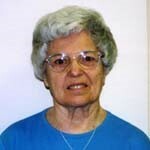 Sr. Elaine Marie was preceded in death by her parents and her brother. She is survived by her sister-in-law, Audrey Carey, and nieces and nephews. A Vigil of Remembrance Service was held at the Dominican Sisters of Peace Sansbury Care Center Chapel in St. Catharine, KY, on Thursday, November 1, 2018. The funeral liturgy was also held at the Sansbury Care Center Chapel on Friday, November 2, 2018. Sr. Elaine Marie Carey was interred at the St. Catharine Motherhouse Cemetery. Memorial gifts in Sr. Elaine Marie Carey’s memory may be sent to the Dominican Sisters of Peace, Office of Mission Advancement, 2320 Airport Dr., Columbus, OH, 43219or submitted securely at oppeace.org. To view or download a copy of this memorial, please click here. 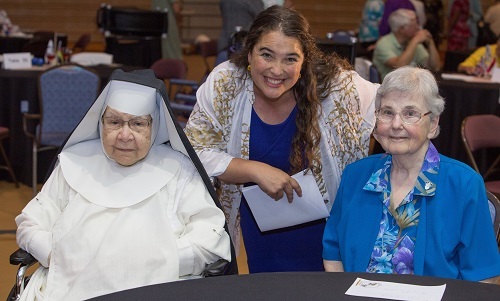 Sr. Mary Carmel Lectora, left, along with Sr. Mary Daniels, right, served as a witness to the temporary profession of Sr. Ana Gonzalez, center, in 2018. 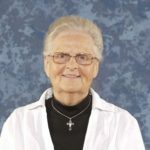 Dominican Sister of Peace Mary Carmel Lectora, OP, (96) died at the Mohun Care Center in Columbus, OH, on October 12, 2018. Sr. Mary Carmel was born in 1922 in Guayma, Puerto Rico, one of the seven children born to Elisa Desrrivieres and Pablo Lectora. She entered the congregation in 1951, made first profession in 1954, and final profession in 1957. Sr. Mary Carmel held a Bachelor of Science degree in Social Work from the Catholic University of Puerto Rico – a degree she earned when she was in her 70’s. Sr. Mary Carmel was a dedicated member of our retreat staff, serving at facilities in New Mexico, New York, Ohio, Pennsylvania and Virginia. She did everything that she could to make the retreat experience prayerful and fulfilling for all who attended. She wanted to make every encounter, with every person, one of love and joy, just as her own encounter with Christ was so joyful. Sr. Carmel was much loved by many of the younger Sisters in our Congregation, and by those who remember her from their younger days. At Sr. Carmel’s service, one Sister remembered that when she was a temporary professed sister, they were given a limited amount of time to socialize or play games with their Perpetually Professed Sisters –time was measured by a clock on the wall. Sr. Carmel would turn back the hands of the clock so that the younger Sisters could stay longer, wanting to spend more time with them and make them feel welcome. Sr. Mary Carmel was preceded in death by her parents; Pablo Lectora Fantozzi and Elisa Desrrivieres Lebron, her brothers, Pablo Lectora, Jr. Harry Pablo Lectora, Pablo A. Lectora and her sisters, Marie Teresa Lectora Asch and Anna Carmen Lectora Tiburcio. She is survived by her sister, Esther J. Soffio and nephews. A Vigil of Remembrance Service was held at the Dominican Sisters of Peace Motherhouse Chapel in Columbus, OH, on Tuesday, October 16, 2018. The funeral liturgy was also held at the Dominican Sisters of Peace Motherhouse Chapel on Wednesday, October 17, 2018. A memorial mass was held on Thursday, November 1, at the Dominican Retreat and Conference Center in Niskayuna, NY, and Sr. Mary Carmel was interred at St. Agnes Cemetery in Menands, NY. 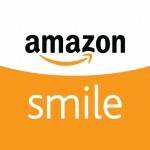 Memorial gifts in Sr. Mary Carmel Lectora’s memory may be sent to the Dominican Sisters of Peace, Office of Mission Advancement, 2320 Airport Dr., Columbus, OH, 43219 or submitted securely at oppeace.org. To view and print a copy of this memorial, please click here.